LSAT India Result 2017 has been announced on June 8. Pearson VUE, the official conducting organisation for the Law School Admission Test in India on behalf of USA based Law School Admission Council (LSAC) has declared the results of LSAT India 2017 for admissions to as many as 83 law schools in India. The LSAT India 2017 results mention the test scores on a percentile basis. Candidates can check their LSAT India results through the official link given in this page. 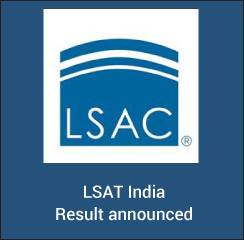 LSAT India as designed by LSAC does not follow any negative marking policy. Therefore no marks will be deducted in case a candidate attempts any question wrong. Further, the scores in LSAT India 2017 are calculated on percentile basis. The LSAT India score is a comparison of performance of one candidate within his/ her group. For example, a LSAT India test taker for five-year integrated law programme with a score of 70 specifies that his performance is better than that of the 70 per cent of the candidates who appear for LSAT India five-year programmes. Further, it should be noted that this 70 percentile score does not mean that the candidates answered 70 per cent of the LSAT India questions correctly. Hence, the LSAT India result 2017 mentions the relative strength and critical thinking of the candidate in comparison to the others.